Beautiful Bottoms: Beautiful Bottoms showcase the Spring Summer 2011 collection at th Music Rooms. Beautiful Bottoms showcase the Spring Summer 2011 collection at th Music Rooms. 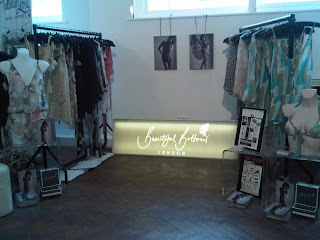 The new spring summer '11 collection had a great response from buyers and press at the Music Rooms in London. The SS11 Collection is five times bigger, offering lingerie, lounge wear, beach wear and ready to wear pieces. With stunning robes, camisoles, slips, and much more. But we are afriad you will all have to wait until March '11! !